Posted by The Grannies on March 16, 2015 . Leave a comment. Thousands of Canadians across Canada joined in public protests against the new security bill, Bill C-51 on Saturday, March 14. The measures proposed in Bill C-51 would afford CSIS and the police considerably extended powers of arrest, detention and surveillance. Although presented as necessary to fight terrorism, these measures are a threat against the personal rights and privacy of all Canadians. 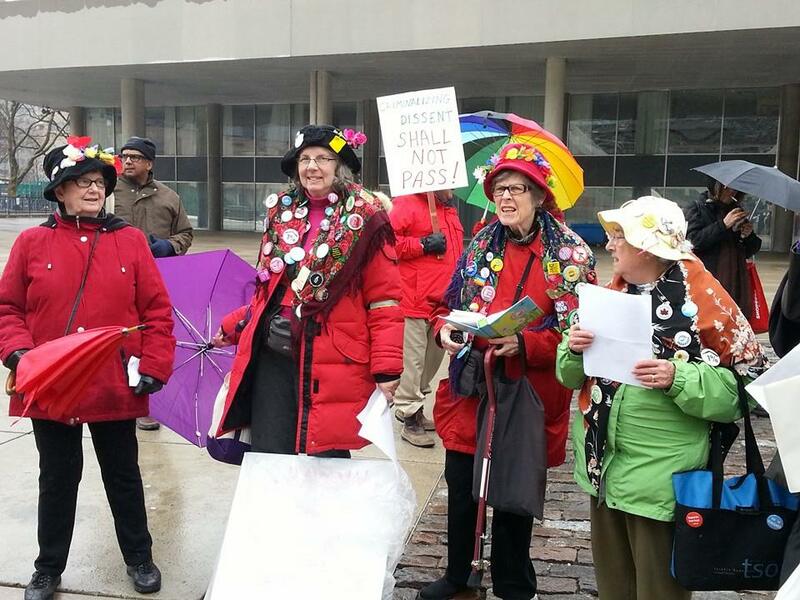 Here grannies Helen, Kate, Phyllis and Dee of the Toronto Raging Grannies voice their opposition at the Bill-C51 protest in Toronto on Saturday March 14.